BBC NEWS | Have Your Say | Will new US fingerprint law work? Will new US fingerprint law work? 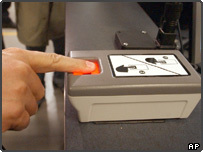 All British travellers to the US will be fingerprinted and digitally photographed as part of new security measures. Previously, this only applied to visa holders but the American Department of Homeland Security has decided to include travellers arriving in the US under the visa waiver programme. The Association of British Travel Agents has said the new law could result in even longer queues at American airports but that travellers' safety would "probably be enhanced". Will the new fingerprint law make travel safer? Or will it deter people from visiting the US? Would you like to see similar arrangements in the UK? Will the fingerprinting of UK citizens at US airports put you off visiting the States? Do you think it will 'enhance safety'? I totally resent being treated like one of their common criminals just because I don't hold an American passport. If it wasn't for my future wife being American, I would never travel there ever again. Is this a way to advocate freedom? I think not. How on earth is asking for fingerprints a violation of civil rights or "treating visitors like criminals?" As an American travelling frequently throughout China, Southeast Asia and Eastern Europe I am regularly searched, questioned, and delayed due to my prior destinations. I view such measures as evidence that the security forces are doing their jobs. Transiting through Honolulu on my way to Canada last month I had to undergo US immigration checks even though I was not entering their country. I imagine if I took the same flight today my fingerprints would be taken. Fortunately there are other routes between Australia and Canada which avoid US territory. I see nothing wrong with the States doing what it thinks is best for its own protection. However, if the threat from Europe is so great and we have (in some countries) better security systems we should do the same to the Americans. Trust is a two way street after all. However, the 9/11 flights were internal and the terrorists were legally travelling under their own names. In politics it is not enough to do something, it has to be seen to be done. To me this is just an over the top measure that the American public can see. It's unfortunate that the innocent people have to lose some of their rights because of the few. How long will it take until we are told to 'show our papers' by a police officer while walking down the street? I have no hesitation to being subjected to having my fingerprints taken should I ever go to the USA. If anything more countries, including the UK should do it, including to their own nationals. Better still, the DSS should be employing similar tactics to reduce claim fraud. I find the introduction of this fingerprint law very sinister indeed. What's more, like many in the UK I was dead against the introduction of a national ID card in this country. So why then would I choose to holiday in the USA so an even more in depth profile of me can be built up and kept stored on some computer until the end of time? Until this policy is revised I'll be holidaying in Europe! I have been to the US many times, but I will not be going again in the near future. I have no problem with either fingerprinting or photographs, just queues. Why can't I give my prints, picture and passport details at the US Embassy and then go straight through Immigration when I get there? If you go to another country as a foreign visitor, surely you agree to follow their rules. I see no harm to this at all. What I don't understand is why we, and other countries in Europe, aren't doing something similar. If 9/11 can happen in the US, something equally horrific can happen elsewhere. In many states within the USA now, to obtain a drivers licence, the individuals fingerprint is scanned. It is really no big deal. And if I ever visit the UK again, and if the UK adopts this same procedure to scan US Citizens, to me it still will be no big deal. I have nothing to hide. I don't have a big problem with being photographed and fingerprinted. I just hope that the Americans have built significantly larger reception areas at their airports to accommodate all those waiting to be processed. I trust this country will be doing the same to visitors from the US of A? When I passed through JFK 3 weeks ago, it took 90 mins to clear immigration - the foreigners didn't get dealt with until all of the US citizens were through. Taking fingerprints won't make the US any safer - seemingly it is important to be seen to be doing something than actually doing it. The UK government should introduce reciprocity immediately. To Jan from the UK, get over it and stop crying! I work for Immigration/Customs at JFK. When you have 6-8 flights landing at the same time with an average of 200 passengers, it's going to take a long time. Shouldn't US citizens be processed first? When I visit other countries I follow their rules, including being printed and photographed or waiting in line while the locals breeze through Immigration. Arguments about civil liberties and long waits at immigration miss the point. The 9/11 flights were internal and so the logical response should have been to fingerprint and photograph travellers on domestic flights. And even then the hijackers had no intention of passing through the immigration halls. As a British citizen who now lives in the US, I welcome the move. Having, last year, driven from North Africa to Oxford without once have to have shown my passport, I feel that the UK should also be adapting higher security. Having your finger print stored and compared to an international database will not worry those who have nothing to hide, and the majority will welcome the additional security. The people who are so upset about this minor inconvenience seem really dramatic and obnoxious and I'm glad they won't be visiting. The US has every right to make sure the people entering the country are who they say they are. Placing one's finger on a scanner and having a photo taken is just not a big deal. Is there anything you people don't whine about? Every time I go to Europe, I get asked if I'm bringing in guns. I have a feeling I'm only asked this because I'm American. I get asked the same question when crossing the border into Canada. Yet I don't go whining about it, except on here. If you can't stand to have yourself finger printed, then you've obviously got something to hide. Deal. I wonder how long it will be before Jeb asks his brother to rescind the laws because Florida is not getting enough tourist dollars? I have visited the USA quite a lot in the past few years. However I won't be going back for a few more, as it is getting to be a real hassle with queues, discomfort and inconvenience. There must be another way found, so that honest, law-abiding people are not so badly affected by the actions of a tiny percentage of criminals. When I worked in Japan thirty years ago I had to report to the local police station to be fingerprinted. The same was true of all foreigners in Japan. I thought it was a sensible precaution and I don't remember any civil rights activists complaining about it to the Japanese. At that time I think the campaign to 'save' whales was more fashionable. Arrogance. That is the only word I can use to describe some of the attitudes here. No one has the RIGHT to enter a foreign country. In fact, it is a privilege and should be treated as such. The US must do all it can to protect its citizens. People who cannot understand that are selfish. Personally I would like to see a decrease in visitors to my country. Perhaps this would reduce the risks even further. Stay home if you don't like our rules. To Brad, Ohio USA, You're right. No one has a 'right' to enter someone else's country. So what are we doing in Afghanistan and Iraq? You're attitude is the arrogant one. I am a physically disabled traveller. Travelling for me on planes is already a nightmare, this only makes it worse. I will not be taking my yearly holiday to the USA in March 2005 now. Instead I will tour Europe and I suspect a lot people will change their plans too and can you blame them? As a regular traveller to the USA, I fully welcome this measure. I really can't abide the whining liberalists claiming it's about civil liberties and punishing the innocent. The world changed forever on September 11th. Wake up to these facts and you may well get over it. If you make it harder to get into USA by plane then ergo plane travel gets safer. That for me is worth an extra 30 minutes in a queue. I don't care whether I am fingerprinted or not, but my concern is that it took two hours to clear immigration in Newark the last time I travelled and this will make it worse. It is hard enough going through immigration as it is. 3 months ago, I had to pass through Miami to catch my flight into Central America and had to wait 1.5 hours in the queue! I just arrived in Texas last week and was ID'd by their new method. It was not too time consuming. However, I do agree that it's a slap in the face to friends and allies of Uncle Sam. Let's reciprocate in the UK as the Brazilians have done. I moved to New York shortly after 9/11 to help rebuild the company I worked for and lived there for 2 years. I have been back to NYC many times this year and had my fingerprints taken. The whole process adds a couple of minutes to immigration procedures that had always been a long process at JFK. I welcome the move and think that the UK should introduce such checks at ports and airports to people visiting the UK. Yet again the law abiding majority are seriously disadvantaged because of the few terrorists. The measure will do no good as long as there is the very leaky Mexican border. It will, however, add support to Blunkett and his police state identity cards. I travel to the US at least once a quarter and immigration is a long slow process. Recently at Raleigh in North Carolina we had to stay on the plane because the corridor and escalator were full from the flight before, and the arrivals hall from the flight before that. Any extra security measures are welcome but lets hope they've added more staff or we'll be reduced to circling the airport. I am far more deterred from visiting the USA by their crazy gun laws, and levels of violent crime. This is essentially a publicity measure, designed to keep Bush's "war" on terrorism in full public view (just like the disgraceful treatment given to Cat Stevens last week). We should remember that the USA's first responsibility is to its own citizens, by preventing known terrorists from entering the country (and we should definitely be doing the same here). If you don't like the arrangements then don't visit. The US will hardly miss the tourist dollar of a paranoid few. I also notice from the US Immigration website, that it only applies to people 16-70 years of age. I was not aware of any international laws about the minimum and maximum age or terrorists!!! My brother is getting married in the US and the only way I will go there is by stopping in Toronto and driving across the border. You couldn't pay me to go there under any other circumstances and I would never, ever, ever fly there. Some democracy. I don't care about being fingerprinted. But unless the US government wants to discourage even more people from visiting, they must employ more officers so visitors don't have to spend 1-2 hours queuing on arrival for immigration, then more to wait for customs officers to interview every visitor - even those with nothing to declare. I have travelled to the US 10's of times over the past few years for both business and pleasure. Unless things change for the better I have now had my last holiday in the US and will avoid business trips unless absolutely necessary - to the detriment of the US company that I work for. I thought we were fighting to preserve our freedom, not throw it away. I have to travel to the US this weekend and now wish I wasn't. I do not have a police file in this country so why should I in another? How can we, as visitors to the US, be assured of confidentiality of our personal details? This will be my first and last trip to America. It will deter people from visiting the US after hearing that the system accidentally matched fingerprints with wrong faces. There will be delays and chaotic conditions in the arrival terminal. I won't like to see similar arrangements in the UK. London has one of the world's biggest airports and handles a lot of passengers per year so the arrival terminal will be like a farm with noisy animals. Well, I'm off to New York for my first ever visit at the end of next month, and am excitedly looking forward to being treated as a criminal as soon as I touch down. With a bit of luck Bush will be voted out soon and these 'security' measures will be ditched soon after. Why aren't we fingerprinting and photographing Americans who come to this country? America is the country which allowed the 9/11 criminals to board the aircraft. They should be looking at themselves not Britain which has always had a better security system. I think this sounds like a good idea and really can't see why everyone here seems to have a problem with it. Perhaps some see it as yet another 'infringement of our civil/human rights'. Well my civil right is to be able to live my life without the fear of terrorism and if this can help, in anyway, to alleviate that threat then so be it. Given all the vitriol dished out towards America by many UK citizens I'm surprised that many are concerned by this. If America wants to do this then that is their law and their business. If you don't like it, go somewhere else. It's a shame the UK doesn't operate that principal. I'm sure America won't miss you. Strange about this fingerprinting of visitors to USA when all the 9/11 aircraft were internal flights. I shall think twice about crossing the Atlantic. Will we be doing the same to all Americans coming into this country? Probably not as they would feel amazed we would consider them a threat. I will not travel to America to be treated as a suspect when I arrive, I'd rather go somewhere normal. I travelled to the US earlier this year when they had started the fingerprinting and photography of individuals who did not have machine readable passports. It was the first time I had travelled to the US since September 11th and although there was a short delay whilst we waited for the people to be fingerprinted etc, I think that there will be a considerable delay when it is introduced to include those with visa waiver forms. However, we still had to go through several minutes of questions in San Francisco which was our first port of entry and again in Vancouver whilst catching a connecting flight to get back to London. What took more time though was the complete searching of our hand luggage and the requirement to take off our shoes and remove belts etc so that they could be checked too. Simple, I have decided with my partner that we will never again travel to the US. We would feel that we were being regarded as thieves or criminals. I also wonder whether this applies at the borders between Canada and the US. Every year I travel to Florida for our family holidays. I resent being treated like a criminal and will not be visiting the States. I don't want to be treated as a criminal when visiting the US. So I will just not be going back and will take my holidays and the money I would have spent elsewhere. As a side question - is this part of the thanks that the people of Britain receive for all the assistance that our country and its people gave America and continues to give in the war on terror?? Yet another reason not to visit the US. Presumably our puppet government will be following suit over here soon enough. How much more liberty must be taken away before the people put a stop to this? I'm not 100% sold on the idea that taking every passenger's fingerprints will make travel to the US any safer. Whilst it will help keep tabs on the movements of listed criminals, terrorists and troublemakers, how will it stop crimes being committed by new offenders? So much for any "special relationship". US customs officials are miserable and nasty enough as it is without this new measure to amuse them. Besides, I'm sure they'll be too ignorant to use it properly - these are the same people who forced the 70-year old father of a friend to drop his trousers in the airport when they refused to believe he had an artificial knee. It won't make a blind bit of difference, not unless they have the fingerprints and the mug shots of all terror suspects around the world. This is all about "We are America and we will do what we want". Perhaps the UK ought to make US travellers go through same humiliation. It is about time the UK pulled back from the so one-sided special relationship. Finger-prints and mug shots are for suspects and criminals. They quote attacks like that of September 11th as something they are hoping to foil with these measures, but as we all know, those particular perpetrators were legally travelling on their own documents using their real names, so it wouldn't have helped! It's another knee jerk reaction because in politics it's important to be seen to be doing something regardless of whether the action is going to be effective.